They say April Showers brings May flowers, but what do April Snow storms bring May? NO MORE! GET THIS CRAP OUT OF NEPA!!!! This is a problem. i love snow and cold. But i've got tickets for my little girl to see Hamilton on Sunday. Come on, MECS SECS HECS, hold off for another day. please! sroc4 wrote: They say April Showers brings May flowers, but what do April Snow storms bring May? I’m hoping it brings the elusive May snow storm. I still remember the May 9-10 1977 snow storm around these parts. NYC received only a trace but you didn’t have to travel that far outside the city to see several inches. One town at a fairly high elevation in the Hudson Valley received 27! Inches from that storm. I’m hoping we all can experience that someday. Mikey P while I COMPLETELY understand your frustrations with mother nature affecting your livelihood please keep those frustrations in the banter thread. Thanks Bud. Greener pastures are not that much further away. 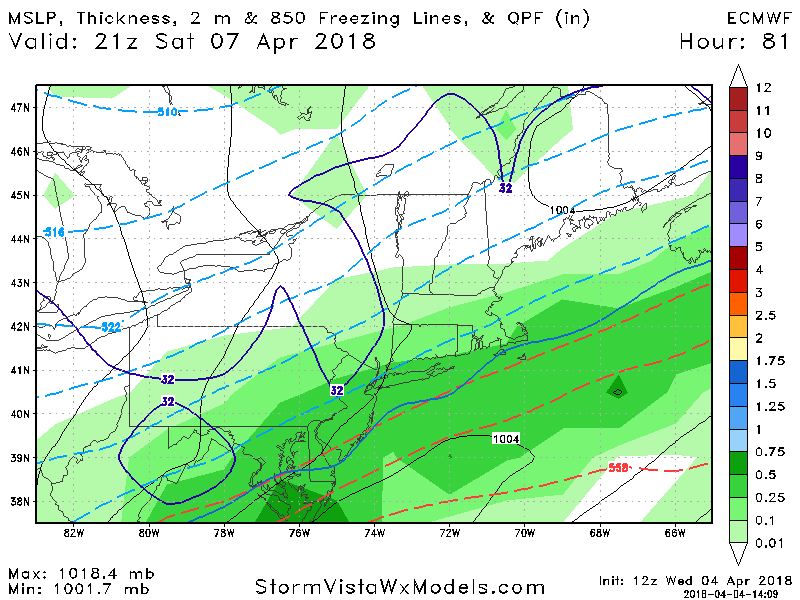 Probably too early to lock in specifics, but as of now, looks like rain showers overnight Friday into Saturday transition to snow during the morning Saturday and the snow gets heaviest from late morning to afternoon before ending Saturday evening..
Temps well below freezing at the upper levels Saturday and right at or just below freezing at the surface during the late morning/afternoon. If snow is at least moderate (and certainly if it's heavy) in intensity it should stick, but if it is light may not stick on some roads. Bill, we didn't think much would stick on Monday, but we ended up with about 5" on paved surfaces, 7" on grass, so who knows! wtf..I know of the trace recorded in NYC but I didn't know that was an actual storm that produced significant snow in the region. I guess I assumed it was just a few renegade flurries they were lucky to spot making it to the surface from an unusually strong cold front or something. I like snow but I find the idea of acclumating snow in May a weather nightmare. Of course once it actually started I'd be excited. I just wouldnt be rooting for it beforehand. Timing not good on the Euro. Was hoping much later in the afternoon to evening not midday. I’ll still take it though. Dunnzoo wrote: "Thank you sir, may I have another?" 18Z NAM is a solid 6-8" for most north of 195 in NJ. 850's are cold and surface near freezing. 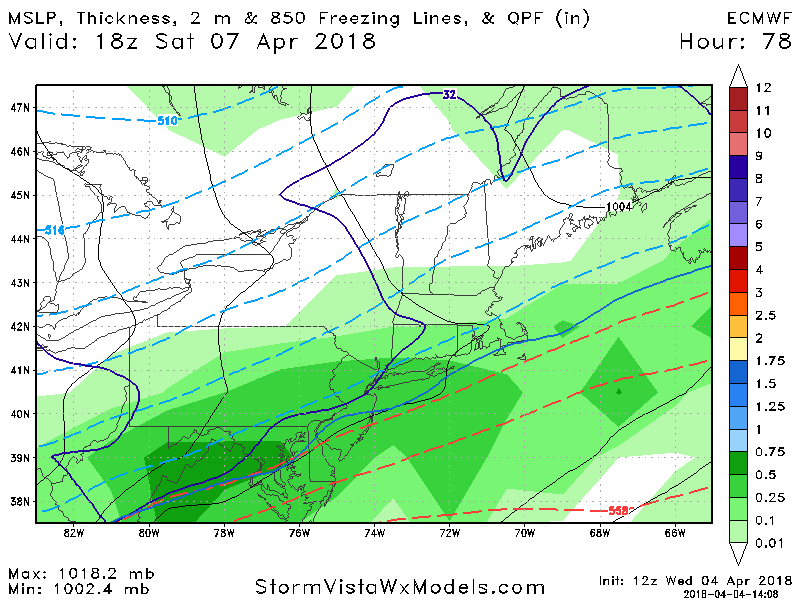 Precip is mostly Saturday during day, not ideal, but rates look to be high in morning. which models are trying to key in the position and strength of. If we can get the snow to start before 7 am and keep it falling at a good clip it should accumulate because we’ll be close to freezing and we could get a base. But in areas where the rates aren’t good it will not stick midday in April. If it does stick it may not need to be quite as heavy as Mondays snow to add up as this seems a slightly longer duration event than Monday (which for me lasted about 5-6 hours total with only 2 hours of heavy snow).